Very few dental practices offer specialist oral surgery services. However, at Meadowbank Dental Practice we treat patients in our oral surgery clinic, which has been successfully run by Dr Girish Bharadwaj since 2006. We aim to treat all oral surgery patients within 4-6 weeks of referral. Oral surgery is a dental specialty focussing on the diagnosis and surgical treatment of diseases and abnormalities in the mouth. Whether you are already one of our patients or are referred by another dentist, we will provide you with an effective treatment plan and the highest standards of care. Most tooth extractions are simple procedures that can be carried out by your dentist under local anaesthetic. However, more complex extractions sometimes require more complex treatment under the care of an oral surgeon. Particularly with top molar teeth, part of the root of the tooth can sometimes be dislodged into the sinus cavity, and some patients experience cheek pain or fluid running through the nose. Our oral surgeon can treat these problems with simple surgical procedures, although some may require a general anaesthetic. Wisdom teeth are usually the last adult teeth to appear, right at the back of the mouth. They are prone to becoming impacted and can develop problems such as pericoronitis, a persistent infection of the gum overlying a gum that is partially covering the tooth. Wisdom tooth extraction is one of the most common oral surgery procedures, and can be carried out under local anaesthetic, sedation or general anaesthetic, depending on the complexity of the procedure and on the patient’s individual needs. 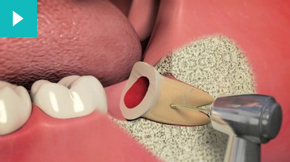 This is a minor operation carried out in the root end of a root treated tooth which shows signs of recurring infection. It is performed to relieve the infection and fill the tip of the root so that the infection does not egress to the surrounding bone. By this type of surgery any cysts in the area of root apex can be removed. Part of a standard dental check-up includes an oral cancer check. If abnormal lumps, cysts or ulcers are found by your dentist, you will be referred to a specialist for further investigation. Benign lumps in the mouth include polyps, warts and mucocele, and these will be removed under local anaesthetic by your oral surgeon. They will be sent for a pathology report and if anything suspicious is found you will be referred to hospital for further treatment. Cysts of the jaw can also be removed by your oral surgeon and will be sent for pathological examination. Dental implants are a common solution to missing teeth. Visit our Dental Implants page for full details of the procedures involved. The temporomandibular joint (TMJ) is the joint between the lower jaw and the skull. Here there are four powerful chewing muscles that move the jaw to speak or chew. Problems with the joint include clicking, locking and painful jaws. There are many treatments that will be considered before surgery, including a special device to wear in your mouth to stop you grinding your teeth at night. Surgery is only necessary in a minority of cases.